If your company is looking for a reliable copier company in Mesa, consider Arizona Copiers. We provide quality, tested copy machines in the Phoenix Valley. With our copy machines, you will experience years of reliable service. We also provide comprehensive business solutions for sales and repair services for office fax machines, copiers, laser printers and multi-function devices. Consult with us today about your specific copier needs. We can help you find an affordable, reliable copier that will serve your company’s needs for many years. Mesa Copiers can help give your business the edge it needs to dazzle clients in presentations. Produce professional quality documents with brilliant color features and clarity. Let our copier company in Mesa help you produce workplans that stand out and get noticed. Develop presentations that convey your particular message with outstanding graphics and interactive displays. Conduct Board meetings and conferences with the confidence that your image is professional and your message is delivered correctly. Educate employees and staff with training courses and educational materials that help convey important issues like health and safety training, and technical training and certification. With the high cost of energy these days, your business is looking to increase energy efficiency and reduce energy costs. Mesa Copiers is the best copier company in Mesa for all your reproduction and reprographic needs. Consider replacing your outdated copier equipment with new models that will save hundreds of dollars in energy costs, reduce environmental impact and encourage use of green technology. Be a more responsible, green tech company by replacing older copy equipment. Reduce your company’s environmental and carbon footprint with energy saving copy machines. Mesa Copiers can help you protect and secure your vital documents and electronic data. Don’t lose important client and customer information again! Use advanced photocopier features designed to back-up your important data onsite or on the cloud. Make sure your business partners have secure access to critical data for decision-making. Roll out new products and services with confidence. Many of the new copiers operate like tablets and other hand-held devices, with intuitive screens and touch-screen operability. 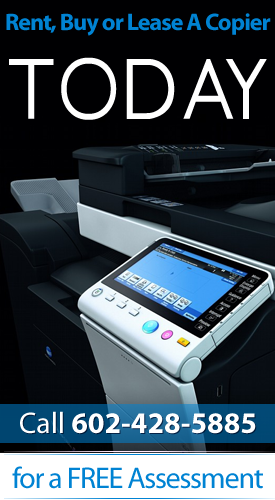 We provide easy to use and dependable copy machines with the convenience of portability and reliability. Your copy machine is much more than a workhorse onsite. For employees and vendors working remotely, information can be sent, received and accessed on a secure platform. Because our customer service is world-class, you know you’re getting superior quality, portability and dependability.